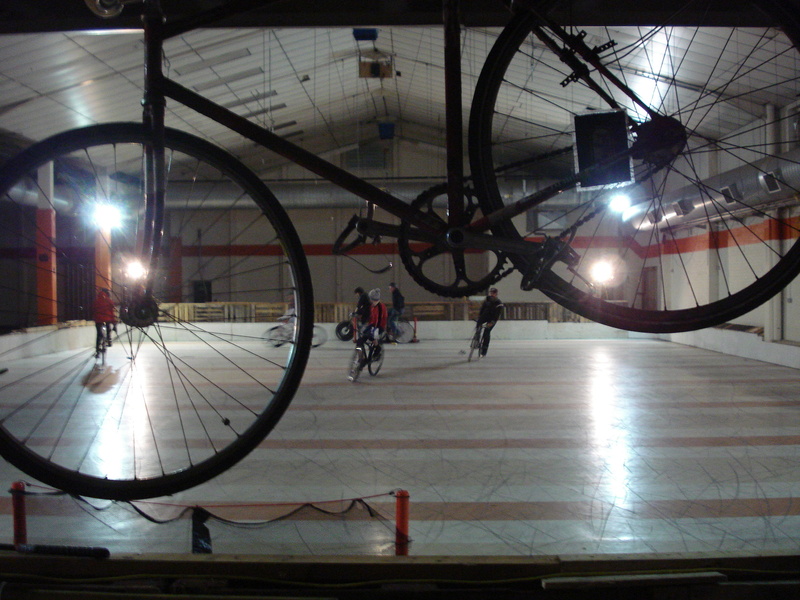 Cambrige Visit | Birmingham Hardcourt Bike Polo, UK. Last night, four of Birmingham’s more intrepid players made the jaunt over to Cambridge to check out their new court. Unfortunately, they only have it for a few months, but what they’ve managed in such a short time is inspirational. After walking through an anonymous door this is the sight that greets you. On first impressions, I thought it looked really short – almost square. The surface also looked shiny and slippy like a shopping centre. I also noticed the goals, which are probably the best I’ve played on – really sturdy. After weeks of wet or frosty polo, I was itching to get on court. At first I was really tentative because it is so smooth and looks so slick. In fact, there’s loads of grip and skidding is nice and predictable. It was a steep learning curve and within minutes I was confident. The short(ish)ness of the court works fine, as it’s nicely wide. Girth is more important than length, obviously. Plenty of room to move when you’re bearing down on goal, or being bored (born?) down upon, and there’s less end-to-end chasing. Something about the court just felt ‘right’. Sometimes playing on a new court, it’s hard to get a feel for where you are, and you keep over- or underestimating distances. Not here. 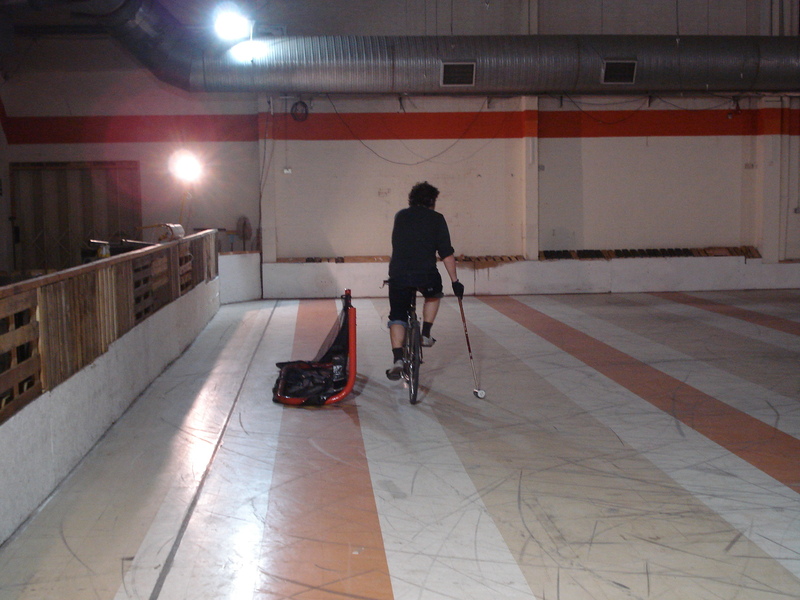 It was three of Brum’s newcomers’ first polo trip, and they had their eyes opened to the potential of an indoor court. This is the future. We called it a night just after 10pm, although this place is like a casino; I could easily see myself checking the time on polo night to find it’s 3am. A big pat on the back to everyone who put this place together, and thanks for having us over. I reckon you’ll see some of us a few more times before it gets demolished. 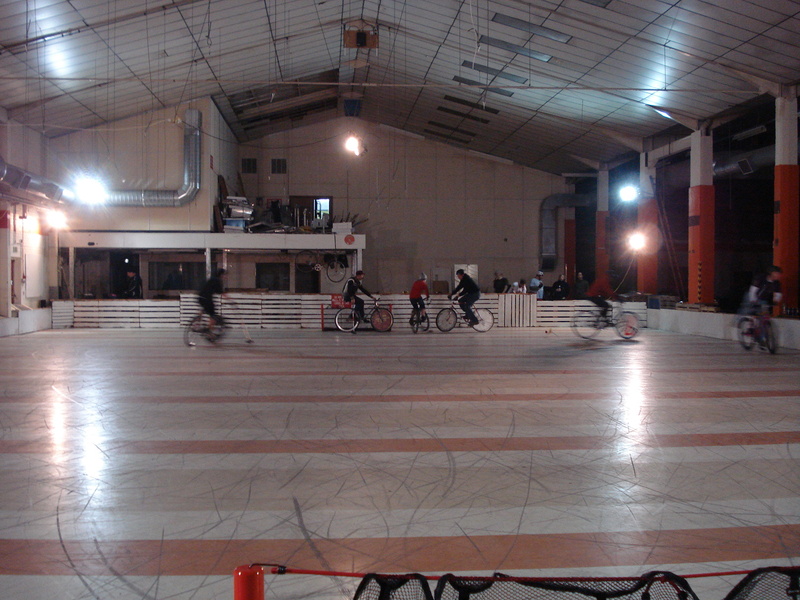 This entry was posted in Birmingham Bike Polo and tagged bicycle, bicycle polo, bike polo, birmingham bike polo, birmingham polo, cambridge, Cambridge indoor open, Cambridge Open, Cambridge Polo Tournament, Feb Boy 3, Team Cream, Three guys ten eyes. Bookmark the permalink. it was definitely the BFF tournament where we battled. Ha ha, solid? Stabbath? I think not. Sorry to disappoint, but it wasn’t the BFF. Definitely the London Open. I know because we didn’t go to the BFF last year! Also, it was you Hayden and Luca, surely a one-time-only lineup? If I can make it down with fellow Stabbath T-Shirt owners, we’ll happily give you a game. We will of course need a two-goal head start to account for your home court advantage. Yep, my bad, the BFF was the mixed teams event. In the Open we got slaughtered in every game pretty much. We haven’t looked at each other the same nor spoken since.